I want to install blue neon or LED lights in the footwell of my 98 lude, so that when the headlights are turned on, the light around the driver and passanger's feet glows blue. What is the best way to go about doing this, and for a person who has never wired anything in a car, is this a simple mod or what? Thanks! 1.) Go LED better longer lasting and wont kill your battery. 3.) Wire a switch inline and hide it up under your dash where you can reach it and your done aside from using zip ties to secure the light. I sell them and install them as well as have about 1200 dollars worth on my car awesome products! These are the ones that I have settled on. Cheap, but I've still heard nothing but good things from this company and part specifically. Shouldnt be a problem at all. Here we go again.... Nee is Sure to piss someone off... oh well. LED For Sure..... You have a wider array of colors to choose from and can get a better pattern of light (compared to incandescent) if done correctly. The "Battery Killing Issue" isn't really an issue due to the fact he only wants them on when the headlights are on- ie: the car is running. While L.E.D. lighting is more efficient, (ie: less current, less heat) you NEVER want to install any accessory lighting just using a switch. Since the OP stated he wishes to do this right; a RELAY is a must. AND, will work better for his required application requirements. AND, he can still incorporate a switch for manual control.. if that's even a concern? Relay Diagram in a minute. Can I assume you are driving a 1998 Lude? if So then to find the negative trigger wire for the headlights look for the Blue/Red (-) wire in a 8 Pin Blue Connector behind Fuse Panel. Last edited by LilMsPrelude; 12-01-2010 at 10:31 PM. Well thank you very much :] MsPrelude, you seem to know your stuff and seem to be willing to help. Would you mind, if I run into any problems, me sending you a PM? Anywho, how do I go about wiring that flux capacitor again, Nee? I try..... but yes, you may PM me...or PREFERRABLY, post in this thread. Someone may learn from your experience. Do i have to tell you again? I told you to write it down junior. indeed.... and yet there is STILL a RIGHT way that prevents damaging and/or wasting of the meat. Gracias. Contrary to popular belief I DO remember what it was like trying to understand and make sense of electricity. ^ Agreed! And thanks, I'll post any problems I might have! I've thought about doing something similar to this using the same style kit. Only I want to have the lights come on when i open up the door instead of the dome light. Would i still need to tap into the fuse box or elsewhere? Funny thing is my boy mentioned this idea bc he has it in his SI! But that he wired it to his dome lighting so thatwhen the doors open they turn on and when the doors are shut and the dome lights dim that the bars of LED mounted by the footwell dim also! He had them in blue but now has them in white bc the connectors he has are PNP! IMO I think the white looks nice only bc when you enter your car that the footwell lights better in white to see anf then dims within secs like the dome light! That looks like a pretty good deal; I personally like all of the modes these have. I think I'm gonna get these in green. 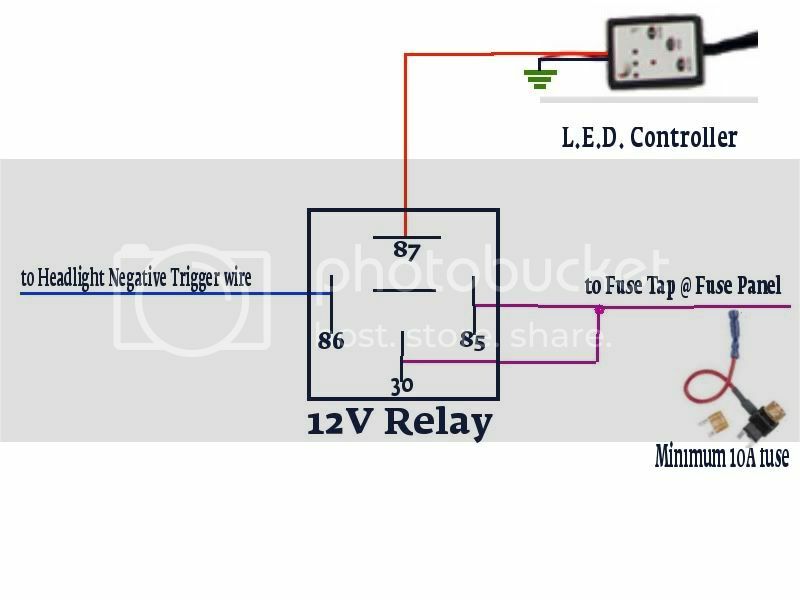 How would the switch for manual control be incorporated into the relay? Im looking to do this mod and I'd like to be able to turn the LEDs off easily if necessary.